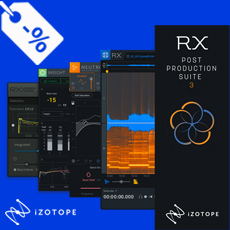 Used on countless albums, movies, and TV shows to restore damaged, noisy audio to pristine condition, RX 7 is a complete toolkit for audio cleanup and restoration needs. Visually identify and repair problems with the standalone RX Audio Editor application, or use the plug-ins in real time in your favorite DAW or NLE. RX 7 Standard introduces features and workflows that allow you to easily edit, repair, and restore audio to pristine condition both in post and music production. Instantly fix clicks, pops, hum, noise with Repair Assistant, rebalance music or isolate vocals with Music Rebalance, and surgically fix dialogue and musical performances using the editor or plug-ins. Are the vocals too quiet or the drums too loud? Can’t find the original stems to your song? With Music Rebalance, no mix is “final.” Using an algorithm trained with machine learning, Music Rebalance can intelligently identify vocals, bass, percussion, and other instruments and allows you to individually enhance or isolate elements of a stereo audio track, making remastering without multitracks possible. Variable Pitch - Adjust the pitch of an audio selection while preserving the time and length. De-bleed - Remove headphone bleed from an acoustic guitar track, click track bleed from a vocal take, and fix other signal bleed issues. De-ess - Tame overly aggressive sibilance. The Spectral De-ess mode transparently attenuates sibilance with iZotope’s Spectral Shaping technology. Mouth De-click - Remove distracting mouth noise with the low-latency Mouth De-click. Spectral Repair - Visually paint away audio problems like ringing cell phones, birds, and squeaky bass drum pedals. Voice De-noise - Fine-tuned for vocal application, reduce unwanted steady state or changing background noise like air conditioning, refrigerator hum, and amp hiss. De-plosive - Transparently repair unwanted plosives with a single click. Spectral De-noise - Attenuate amp buzz, tape hiss, and other unwanted steady state background noise. De-click - Clean up vinyl clicks, soften up click-y bass guitars and more. The low-latency algorithm enables you to use De-click right within your DAW or NLE without introducing sync issues. De-clip - Repair digital and analog clipping artifacts to restore distorted audio. De-hum - Remove ground loop hum and line noise. Composite View - Fix problems picked up by multiple microphones by editing multiple files at once.